This is the story an eleven year old boy and his adventures aboard a ship bound for England from Ceylon in 1950. He is making the voyage alone, to meet his mother whom he has not seen for five years. Mynah and two other boys, Ramadin and Cassius, are seated at the lowly Cat’s Table along with a number of fascinating and intriguing adults. The reader is shown the world aboard the ship through the eyes of this child, approaching adolescence with all his innocence and the misunderstandings of children, thrown into an adult world. Mynah and his two friends tumble from one adventure to the next, getting under foot and creating a certain amount of havoc. The boy’s beautiful cousin, Emily who is also on board, is tangled up in a web of deceit and secrecy surrounding a shackled prisoner. The trio of boys is fascinated by this man and watch from the safety of the lifeboats as he is taken up on deck each evening for air, shuffling in his manacles and leg irons. Emily becomes Mynah’s confident and is the object of his budding desire. Minah’s story strays into manhood where things only partially understood during childhood become clearer as he reconnects with first Ramadin and then Emily. The Cat’s Table is a beautiful tale of innocence, intrigue and love that will leave you wanting more of this author. Sixteen year old Noa has been cast out in disgrace after becoming pregnant by a Nazi soldier After this judgement by her father, she is forced to give up her baby. She lives above a small rail station, which she cleans in order to earn her keep. When Noa discovers a boxcar containing dozens of Jewish infants bound for a concentration camp, she is reminded of the child that was taken from her. In a moment that will change the course of her life, she snatches one of the babies and flees into the snowy night. Noa finds refuge with a German circus. Here she must learn the flying trapeze act so she can blend in undetected, spurning the resentment of the lead aerialist, Astrid. At first rivals, Noa and Astrid soon forge a powerful bond. As the facade that protects them proves increasingly tenuous, Noa and Astrid must decide whether their friendship is enough to save one another, or if the secrets that burn between them will destroy everything. Jenoff tells this gripping story in the first person narrative, switching between Noa and Astrid’s point of view. A novel of historical fiction, this book is well researched and seems to ring true to the era in which it is set. As children of Canada, never exposed to the atrocities of war, there were attitudes and actions prevalent in war torn Europe that we can, fortunately, not fully understand. Even though there are acts of unwarranted aggression and betrayal depicted in this story, The Orphan’s Tale is never the less a book of hope, love and generosity of spirit. “In the Old City of Quebec, Kay Harper falls in love with a puppet in the window of the Quatre Mains, a toy shop that is never open. She is spending her summer working as an acrobat with the cirque while her husband, Theo, is translating a biography of the pioneering photographer Eadweard Muybridge. Late one night, Kay fears someone is following her home. Surprised to see that the lights of the toy shop are on and the door is open, she takes shelter inside. The next morning Theo wakes up to discover his wife is missing. Under police suspicion and frantic at her disappearance, he obsessively searches the streets of the Old City. Meanwhile, Kay has been transformed into a puppet, and is now a prisoner of the back room of the Quatre Mains, trapped with an odd assemblage of puppets from all over the world who can only come alive between the hours of midnight and dawn. Donohue weaves a tale of motion counter pointed with stillness in a story that reads like folklore. He interlaces the effects seen in pioneering motion pictures with the same jerky motion of marionettes. The police search for Kay stops and starts, leaving the reader and Theo alternately frustrated and hopeful. The novel is a bit fantastic but a good read if you are able to let your imagination loose. To an amateur student of world war 2 this book is nectar. While many books and a least one movie have been produced to chronicle this remarkable mission, Barris, no slouch, having written many books about the war, takes a particularly Canadian perspective. 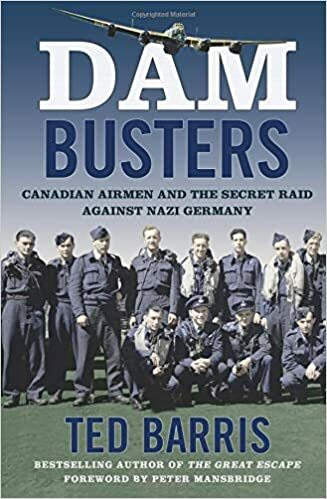 The story centres around 617 Squadron, its commander Guy Gibson and 133 incredibly brave airmen that attacked 3 dams in the Ruhr valley on May 16-17, 1943. Two of the three dams were breached using tactics and a unique bomb designed by an eccentric engineer by the name of Barnes Wallis. The dams supplied hydroelectric power to the war industries in the Ruhr valley. The intent was to cripple the Nazi’s ability to produce armaments and divert troops and workers away from other areas. Historians still debate the efficacy vs the cost: 56 airmen lost or killed and 8 Lancaster bombers (not to mention some 1400 pow’s, slave labourers and civilians on the ground). The Canadian connection has to do with the BCATP, British Commonwealth Air Training plan, which trained 133,000 airmen from all over the commonwealth at aerodromes from coast to coast to fight and die in Europe (of the 58,000 airmen lost in Bomber Command more than 10,000 were Canadian). When I took my private pilot training in Belleville, in the shadow of Trenton airbase, I routinely flew to airports such as Kingston, Picton, Deseronto, Oshawa etc. I knew they were WW2 training bases with their familiar triangular runways but had no idea of the scope of their contribution to the war effort. Also, many Lancaster bombers were built in Malton, Ontario as well as spares and parts for other aircraft. With a foreword written by none other than Peter Mansbridge, whose father flew in Lancasters during the war, this book is both a fascinating and sobering account of a time I hope is never repeated. 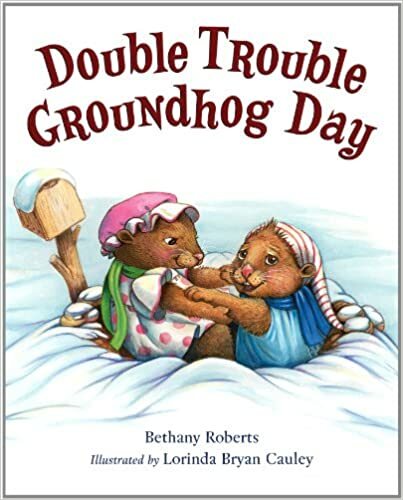 A family of groundhogs is preparing to hibernate for the winter when Grampie decides to hand over his February forecasting duties to one of the grandchildren. Gregory wins the task by drawing the longest straw. This decision made, everyone goes to sleep. But come February 2nd Gregory has lost his glasses and needs Greta’s help. The twins team up and the event goes off without a hitch. This lively picture book about sibling rivalry and teamwork is beautifully illustrated and will capture the imagination of your pre-reader. The Fifth Season is the first in The Broken Earth trilogy. This work of fantasy begins with the narrative in the second person, which is a bit disconcerting at first because it is an unusual way to tell a story. The first 100 pages of the book have a lot of world building in them and it can be somewhat heavy and plodding but if you can work your way through this it is well worth the effort. Once I knew who was who and what the setting was it was difficult for me to put the book down. In fact, I read all three books of the trilogy in less than 3 weeks, which for me, is quite a feat. The protagonist, a girl called Damaya, has been “given” to a guardian because she exhibits characteristics of earth bending which according to the rules of the Stillness, must be harnessed and controlled by those in charge. The narrative flips back and forth from Damaya’s view, told in the third person, and narrative told in the second person, which is actually Damaya as an adult. The series is action packed and fast moving. It explores the issues of mind control, alienation and subjugation of fringe groups, trust and betrayal, love and loss. The characters are deep and it is easy to identify with each one. All show tremendous growth throughout the series and it is difficult not to be invested in their lives. For all you fantasy readers this trilogy is a must. 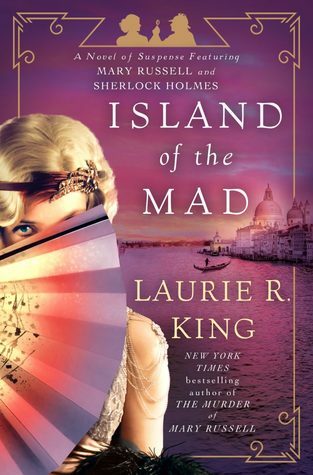 For fans of author Laurie R. King, here is a fantastic Sherlock Holmes & Mary Russell adventure. The Island of the Mad is a co-operative effort between husband & wife in the beautiful city of Venice , to find the missing Aunt of one of Mary’s friends. By using descriptions of the buildings , canals, cabarets, government agencies & daily life in this lovely city , it brings this detecting duo to life. With the mention of figures in history like Cole Porter & Mussolini, the story progresses with great interest & excitement. I enjoyed this book immensely. I love books that take place in Italy. The added history & historical facts seem to be accurate , thus making the story believable.